They’re bAAAaaaaack! This is the first wonton cupcake recipe I’ve made since the French Dip “Cupcakes” in January. Can you believe I let that much time go by? Silly me. I’ve wanted to make a barbecue chicken “cupcake” for a while now, and when I sat down to plan it out I couldn’t stop thinking about contrasting sweet and spicy flavors. I really recommend choosing a barbecue sauce with a hot & spicy kick to it. Trust me, the juicy bites of warm, sweet pineapple smothered in a spicy, smoky barbecue sauce is a combination perfectly engineered to excite your taste buds and make you swoon. Summer is the season for barbecue and if you don’t feel like firing up the grill, these are a great way to get your BBQ fix! 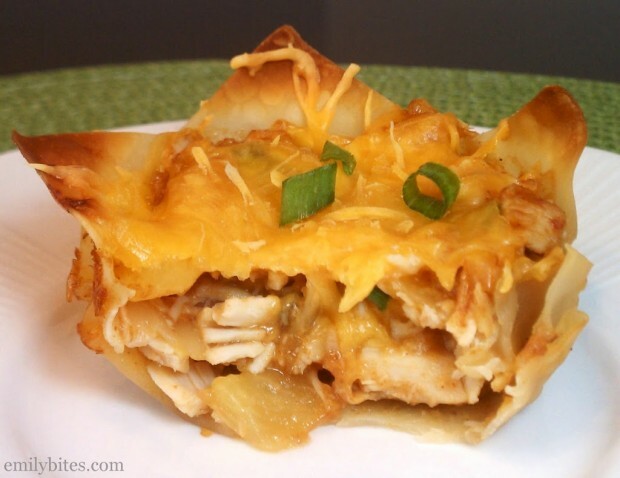 In a medium bowl, combine the chicken, pineapple, scallions and barbecue sauce. Stir to combine until fully coated. Push a wonton wrapper into the bottom of each of the eight sprayed cups in the muffin tin. Using about half of the chicken mixture, spoon evenly into the wonton wrappers. Sprinkle about half the cheddar cheese evenly over the top of each cup. Press another wonton wrapper on top and repeat the layering steps with the remaining ingredients. Mmmmmm……..we are on vacation right now but will be trying these when we get home!! welcome back emily! those look delicious!! These are on our next menu plan, can’t wait to try them Any odeas on what to serve as a side? Maybe some grilled veggies or island rice? Oh my gosh, just discovered your blog thru a wholly guacamole link, and I am so excited! This recipe looks delicious, will be trying it soon. You have an new follower. Thanks, Amanda! I’m glad you found me. Let me know what you try! Looks delish!! Just found your blog through a friend on Facebook!! Can’t wait to see more!! Made these tonight and they were pretty good. I didn’t have a spicy BBQ sauce so I used the regular Sweet Baby Ray’s that we had on hand; it was kind of lacking in “something” with the sweetness of the fresh pineapple. I will make them again though and use a BBQ sauce with a kick as well as some red pepper flakes. Thanks for another great meal to add to our meal rotation. Haha, that’s definitely why I specified spicy BBQ sauce! Glad you’re adding them to the rotation. 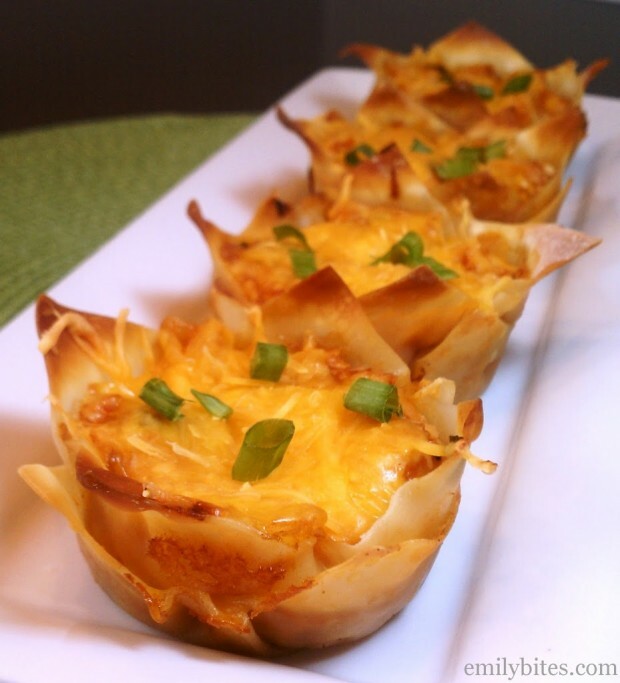 In the last week i’ve made these as well as your buffalo chicken mac and cheese muffins, the taco cupcakes and the cheeseburger cupcakes and they have all been AH-MAZING! I was cooking off of the skinnytaste site but was having a hard time sticking to WW on days when life happened and i didnt have the time to make the meal i had planned. Your recipes are definitely going into the rotation in our house. the muffins and cupcakes are so quick, easy, and delicious; they will SURELY keep us on track. I have to say it will really impact my grocery budget (for the better) as well! Thank you so much for your hard work! Without recipes like these WW would be a challenge in our busy household. Wanted to add that i used ground turkey instead of beef because i had it on hand and i couldnt tell it was turkey at all! Can’t wait to try. I have left over chicken and left over pineapple. Do these freeze well? Loving your recipes!!!! This one is really good. I added cilantro for another dimension of flavor. Yum. Gotta love cupcake dinners!!! I’m trying these tonight …I can hardly wait! Just finished dinner. The Hawaiian BBQ Cupcakes are another ‘keeper’! I’ll be telling my WW friends about them. Thanks again! These look like they’d be great with Huli Huli chicken instead of BBQ sauce maybe- great appetizers for a Luau party! Just made 1/2 a batch to try. They are so yummy, we are taking them to a Halloween party tonight. Can’t wait to try some of the other cupcakes now. Good job! Sorry, I must clarify. I’m making 2 batches to take tonight! Tasty variations: substitute 1/2 of BBQ sauce for your favorite form of pepper jelly (Pineapple & Jalepeno, Mango & Manzana, Habenaro & Strawberry). Limited only by the diversity of your supply of pepper jelly. This looks absolutely wonderful. I haven’t made cupcakes for such a long time I’ve forgotten how good it tastes – and this a really good variation. Just love the sweet taste of pineapple. very good recipe. Delicious, but needed a bit more kick so I added some additional spicy BBQ sauce after cooking and since I found one with low carbs like you suggested, didn’t affect point value. Thank you! 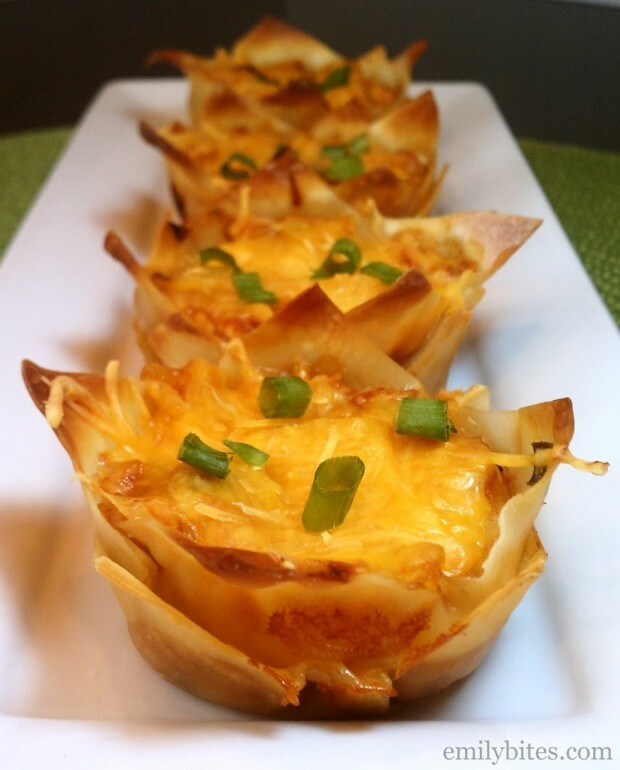 I have been making your wonton cupcake recipes all week, and this one is one of my faves. Eating it again tonight! I changed the lasagna one to a chicken alfredo – use a can of chicken instead of the hamburger, and substituted light alfredo sauce for the pasta sauce. WOW! Also added a big spoon of minced garlic. HEAVEN!!!! What a great idea you had! Mm! I love these, I’ve made them numerous times! Just found your blog, this was the first recipe I tried….drool…so good! This is going to make Weight Watchers so easy to follow! Thanks for all the ideas. I stumbled upon your blog from following a friend on Pinterest. I just made these “cupcakes” tonight. They were AMAZING!!! My oldest daughter and hubby loved them too! I made pizza “cupcakes” for my picky youngest daughter using some of the chicken, chopped turkey pepperoni, and a little pizza sauce. She loved those! After looking at your site, I can’t wait to try more! Somehow the bottom wrapper came out very watery. Any suggestions? Has anyone made these ahead of time? Does the wonton wrapper come out soggy? I guess I could make the mixture ahead of time and just assemble day of? These were wonderful! I also liked them cold. I just found your website and am excited to try your other recipes, especially more of the “cupcakes” using the wanton wrappers. Good idea! Oh my goodness! These are incredible!! They are crispy and crunchy and yummy! I think we have enough for lunch tomorrow. Thank you for sharing this recipe. I had never used wontons before but they make a great crunchy crust. This was super good! Thank you for another great recipe! Huge fan of all of your cupcakes, but when I made these ones they turned out SUPER mushy and unpleasant in texture. I did nothing different with the chicken from what I normally do, any ideas was to why this could problem may have presented itself? Hm, I’m really not sure why that would happen – these have never turned out any different in texture for me from my other wonton cupcakes! I made 4 different batches of cupcakes for the week..microwave them and they are soggy..any tricks to nuke them and have them come out crunchy again? There’s really no way to make things crispy in the microwave, but you can ceertainly reheat them in a toaster oven or put them back in the oven. THESE ARE DELICIOUS! I made them for lunch today and NOM!!! I can’t wait to make these. I think I will make them for Valentines Day, tomorrow. I know this is an old post but how do you all cook your chicken first? Anyone do anything with the crockpot for the chicken?